In one of the previous articles I wrote about our wedding in China and how I experienced it. Now it is time to present you our wedding in Finland! Last summer we had first a “little” wedding in China which was pretty much stressful experience but also at the same time very interesting. About three weeks later we had our wedding in Finland which had been planned for nearly a year by my wife. However unlike in China, we had instead of 100 guests only 50 but at least we knew each single person there! Besides it would have exceeded our financial limits to invite anybody more as Finland is not exactly known to be a cheap country. Our guests included of course both of our parents and much of my family from Finland and Sweden. In addition my brother was flown in with his girlfriend from Germany. The tricky part was to invite our friends as we had only limited capacities which meant we couldn’t just invite everybody we know but had to be very selective. My wife invited some of her friends she knew for years in Finland and also several friends from her work place. I on the other hand invited several dudes from my swimming years in Finland, one guy from my old swimming team in Germany and last but not least my best friend from my youth who extra came from California for this event. The couple of days prior to the wedding were more than just stressful. The location of the wedding reception had to be prepared, people had to be picked up from the airport and delivered at the hotel and of course my wife and I still had yet to start practicing our wedding dance! The night before the wedding we also met at the hotel with some of the guests to have a DIY dinner consisting of potatoe salad, sausages and jiaozi 饺子. This dinner allowed us also to get some dancing practicedone as my uncle from Sweden used to be a dancer. Not that we practiced alot but at least we learned the basic steps. Things became even crazier on the wedding day itself. It started very early in the morning, I had to pick up one bridesmaid from Helsinki city center so she could help prepare my wife with hairs, make-up and her dress. My own preparations were a bit less exiting as there is not much to do except to suit up and put the hairs into a less messy state. 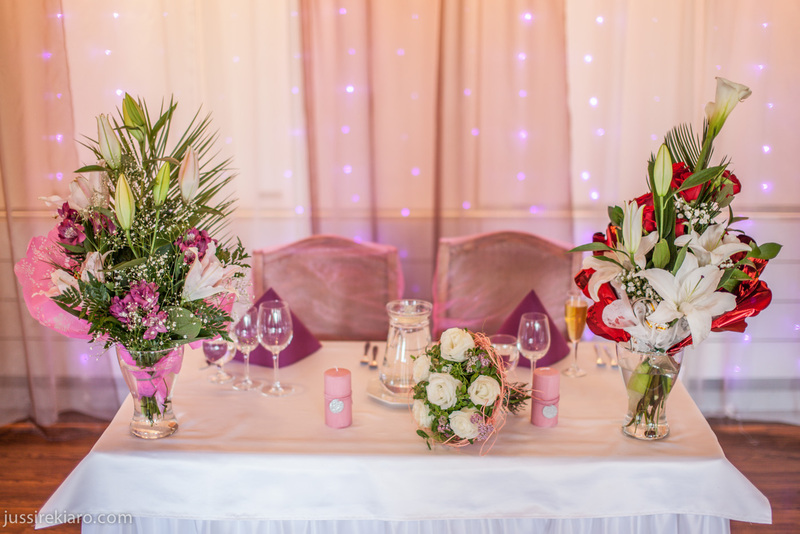 However there was still much to do at the wedding reception because one of our guests changed plans and would not come, my wife had to invite somebody else and my task was to come up with a new seating arrangement + getting the technic to work for the picture screening. This meant I drove very often between our home and the wedding reception, building up more and more stress as time was running out. I do not know how but in the end we managed to be in time at the church. I believe this included several speeding violations on my behalf. Already one year before the wedding we were trying to find the perfect church for us and booked it in advance together with the wedding reception in a manor house near our home (they only had two weekends still free for us at that point, one year before!). Thankfully nothing out of the ordinary happened at the church, not even a crying baby! Our pastor was holding the ceremony in Finnish and in English and in the end we received also a bible in those languages from her. Once we arrived at the wedding reception it was time for some photo shooting, relaxing in the sun and welcoming all the guests before entering the premises. One of my wife’s bridesmaids was the MC doing everything in English, then another bridesmaid was translating everything into Finnish and one of my groomsmen was translating into German and Chinese, hence we had all needed languages covered. Thanks to the MC there was always something going on which resulted that no one was getting bored. She had prepared a full program for that day and it was planned in a way that it allowed much free time between the sections for the guest to get some rest, mingle and pick up few drinks from our car. We had a lot of games, very good food and a wedding dance which was okay for practicing only 15 min before. The celebrations lasted well into the night and in the end we could get our well-deserved rest in the hotel at the manor house. All in all I can say it was a great day, sure it was exhausting but it went very well and thus was a nice experience. Here are some more pictures from that day. I will still try to find a picture from our invitation cards which we had purchased before from China. Both of you make a lovely couple and look so happy in the photos. Sounds like the wedding turned out perfect. Luck was certainly on your side 😀 Congratulations. You’re right, weddings don’t come cheap at all. Even in Australia, you can easily rack up a $20,000 wedding reception bill, more if you choose a really fancy venue and very fancy good. 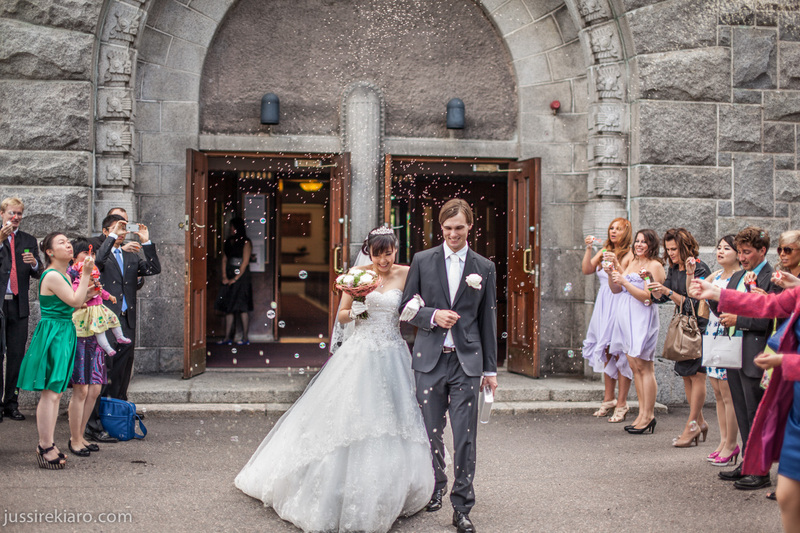 This Finland wedding seems like a much quieter one than the one you had in China. Do you have a preference as to which you liked better? Great pictures! I can’t imagine planning two weddings…one is hard enough! Thanks for sharing with us! Just one question, I am curious to know if it is a Finnish tradition to cut/saw a log at the wedding? Just wondering after seeing your photos. It sounds like the perfect day (minus the running around before the wedding)!! All of your pictures are gorgeous. I particularly love the dancing one – beautiful. And the one with your wife and mother-in-law is beautiful as well – a special moment (your mother-in-law is beaming with pride and you can see the love she has for your wife)!! Lovely pictures! (And at last I know how you and your wife look like, haha). A couple of days ago I read about the Finnish game with the shoes in another blog (a Finnish girl who just got married to a Chinese guy in China), it sounds like a good game for a wedding. I think I’m going to recopilate wedding games from every country and do them all in my wedding. We don’t have any wedding games in Spain 😦 (at least not that I know of). I bet you have some kind of wedding games, at least there must be at least one! im curious about this shoe game, and the log cutting tradition; we also dont have any wedding games in England, which i think is quite boring. you two look stunning!!!!!!!! looooove it! Thank you for sharing the photos. They’re wonderful. What a good looking couple you are! It seemed to be a beautiful wedding. This post made me very very happy. Thanks for sharing snippets of your big day. Okay, what is the shoe game? Every culture seems to have some obsession with shoes and weddings. I met a Serbian/Croatian couple where the bride’s shoe had to be found by the groom. I knew an Indian woman who stole the groom’s shoes from under his groomsmen’ noses and demanded a pretty hefty sum to return them, too. The shoe game here is about knowing each other. So the couple sits back to back and each one got a shoe of their partner and one own shoe. Then the ‘grand wedding talk master’ / main bridesmaid is asking several question such as ‘who is the decision maker’ or ‘who brings out the trash’. It is a pretty fun game also for the guests and we actually got nearly everything right (answered with the same shoes). Thank you so much. She got her gown in China as it was so much cheaper than getting it in Finland. I think we payed/ my in-laws payed around 400 Euros and a similar dress would have been at leat 5000 Euros in Finland! It made me smile reading your story…all is well & ends well. Lovely wedding!